Dance the Dream is a worldwide, year-long tribute in over thirty cities. To participate and receive updates please "Like" our Facebook page. 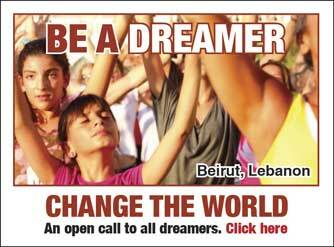 Participating artists for The Dream@50 include Usher, Macklemore & Ryan Lewis, La Santa Cecilia, Seattle Symphony, LA Opera, Joan Armatrading, Common, Skillet, Ahmir, Beygairat Brigade, Afghan Youth Orchestra, South African Youth Choir, and the inter-Israeli/Palestinian Jerusalem Youth Chorus. The Dream@50 Art Contest invites K-12 students in ten U.S. cities to submit artwork inspired by a word or phrase from the "I Have a Dream" speech. Find out more. See our Educational Resources for videos, discussion topics, lesson plans, and reference materials on Martin Luther King, Jr., the Civil Rights Movement, and the "Dream" speech. Learn more. Americorps, United Way, Peace Corps, and Operation Hope are all making a real difference in people's lives. Check them out and volunteer.